Part of the beauty of William Shakespeare’s work is how timeless it is. The seemingly unrealistic, dramatic, even chimerical stories with his colorful characters have been told for centuries, and yet offer lessons and hypothetical situations that could easily occur within our world. One of Shakespeare’s most beloved, and arguably overdone romances, Romeo and Juliet, is no exception to this. 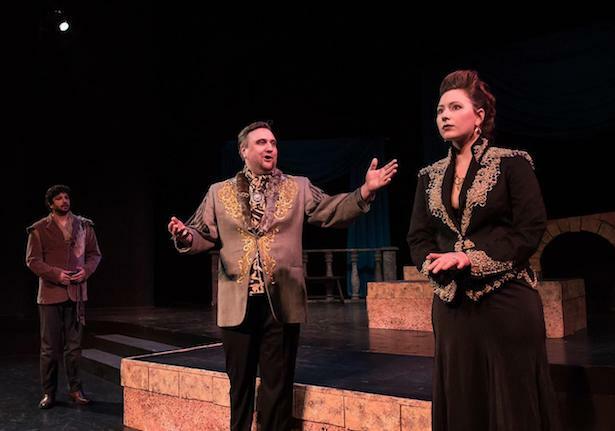 Quill Theatre opened its 20th Annual Summer Shakespeare Festival season with a remount of its previous spring production of Romeo and Juliet with a partially new cast. 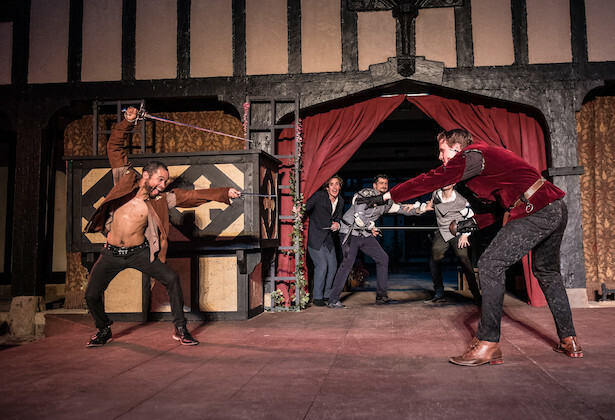 Moving from the Leslie Cheek Theatre at the VMFA, director James Ricks took his production from an energetic, level-heavy piece into Agecroft Hall’s outdoor courtyard setup, mimicking the very space the Bard would have occupied with his traveling troupe. The theatre in the VMFA was a traditional proscenium, with the audience facing the actors on one side; at Agecroft, Ricks had to maneuver his actors around a three-sided stage, opening up to a greater challenge for projection and intimate moments with fellow actors and even the audience. However, Ricks overcame these challenges with great skill, considering his previous directorial experiences with Quill and Agecroft. Because the actress formerly and currently portraying Juliet, Liz Earnest, had a previous conflict for opening weekend, Claire Wittman stepped in to fill the role of the titular female love interest. 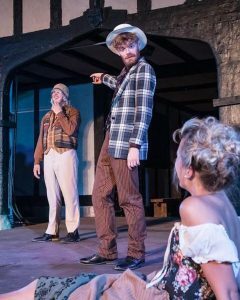 Wittman, who is no stranger to Shakespeare in the Virginia area, filled the shoes of Earnest with grace, youth, and delightful comedy. Juliet is a very difficult character, and Wittman did a marvelous job exemplifying the complexity that Shakespeare gave to this young character; her emotions ran the full spectrum throughout the entire show, from glee to melancholy to excitement to life-altering hurt. Opposite Wittman was a new Romeo, Tyler Stevens. His youthful yet swaggering Romeo gave off the excitement and energy equal to Wittman. There were times, however, that his performance was not entirely convincing and seemed offbeat. Lines were stumbled, relying upon scene partners, but considering it was opening preview night, that might have been opening jitters. Nonetheless, Stevens gave a good effort into the leading man. I will be very curious to see how Stevens grows into this role and, most importantly, adjusts to a new (rather, the original) Juliet opposite Earnest. Romeo and Juliet has a surprisingly numerous amount of roles, and it pains me to not have the room to mention every single actor. Notable talent included the new Mercutio, played by Todd Patterson, and Melissa Johnston Price who gave an unforgettable performance of The Nurse. Many audiences are unaware of the sheer amount of action that takes place during Romeo and Juliet. 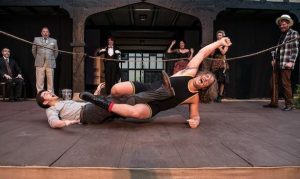 Fights choreographed by Aaron Orensky were plentiful throughout the show, most of them masterfully executed by Josh Williams who played Tybalt, or Axle Burtness, an admirable Paris. However, some of the fights seemed clunky, even slow and therefore not believable, especially in comparison to the previous VMFA production. Stevens was fiery in his delivery during some of the fights, but his movements and confidence were slow in comparison to the graceful Tybalt. The stage at Agecroft is significantly smaller than the Leslie Cheek Theatre, therefore limiting the potential for set and design. The quintessential balcony scene in the show was slightly awkward given the rather low-to-the-ground balcony upstage. For the more visual audience members, the costumes saved the day thanks to the eye of costume designer Cora Delbridge. Her use of color, fabric, layers, and textures were all pleasing to the eye, helped differentiate the two families and their allies, and were period-appropriate. The authenticity of the production value provided by Quill Theatre is usually on point, but certain details were plainly artificial, including some bottles (plastic, not glass) and flowers, but the genuine pieces made up for the more modern aspects. Perhaps the most striking part of this entire production was the relevance of its message to today. Here are two young people, bound by their love, who are questioning the rules, legacies, and traditions set in place by their predecessors. Frankly, the imposed laws are foolish in the eyes of Romeo and Juliet, and they can plainly see it. Their elders, on the other hand, do not until it is far too late. The grim comparison that comes to mind is in the form of the youth today demanding gun reform. Those in power, those that are in charge, are somehow not recognizing the repercussions of their actions- or rather, inaction- to enact reform on guns. Even with the death toll rising month by month, it is in the hands of the youth and their lost classmates, friends, and siblings to change the status quo. I have faith in this production. Summer has just begun, and the magic that Agecroft brings to every production is starting to unfurl. Shaking off the jitters (and raindrops) that the beginning of summer releases is always daunting. It is also worth mentioning that Liz Earnest will be returning to the stage to complete her time as Juliet, and I strongly encourage audiences to see her skill onstage, especially in this role. We shall see what route Romeo and Juliet takes in its time onstage. You can catch the rest of the run until June 24 and can find ticket information here. 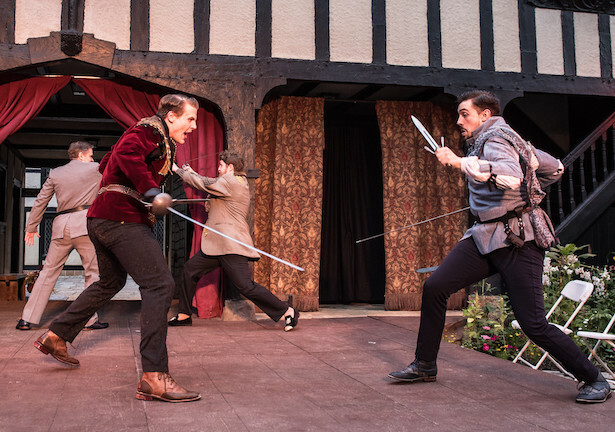 Quill Theatre kicks off its 20th Annual Richmond Shakespeare Festival at Agecroft Hall with a true classic, Romeo and Juliet. Before you disregard the possibility of seeing one of the most popular romances of the Bard, consider the opportunity to re-learn or discover new plot points, romantic monologues, and alternative perspectives within this production. 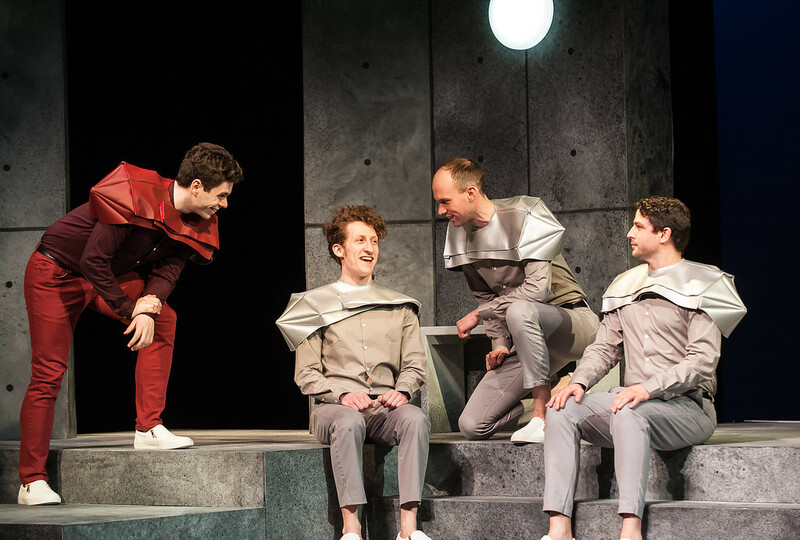 Directed by James Ricks, newly announced artistic director for Quill Theatre, this production has had some practice already since it premiered earlier this year at the Leslie Cheek Theatre at the Virginia Museum of Fine Arts. However, audiences who saw the previous production are urged to attend this new production since a portion of the cast is new and can provide an alternate point of view; the stage at the VMFA is a classic proscenium, with the audience on one side of the stage and the actors facing them. At Agecroft, the audience surrounds the actors on three sides of the stage, known as a thrust stage. “Bringing the show to Agecroft Hall has been thrilling simply because of the beauty of the space,” said Ricks. 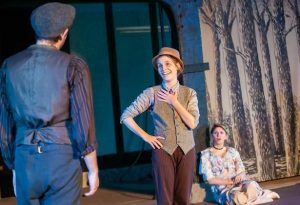 Along with a more up-close-and-personal feel to the stage, audiences can appreciate the outdoor setting, watching the performance under the Richmond summer skies, surrounded by Agecroft’s carefully attended gardens and grounds. In case you need a brief refresher, Romeo and Juliet thrusts its audience in the middle of a bitter feud between two families, the Capulets, and the Montagues. A teenager from each family falls in love with the other in a classic star-crossed lovers fashion, amplifying the feud between their families. With the help of deceit, potions, and misplaced letters, the lovers find themselves on the same deathbed with their families left to pick up the pieces. Sounds familiar, right? 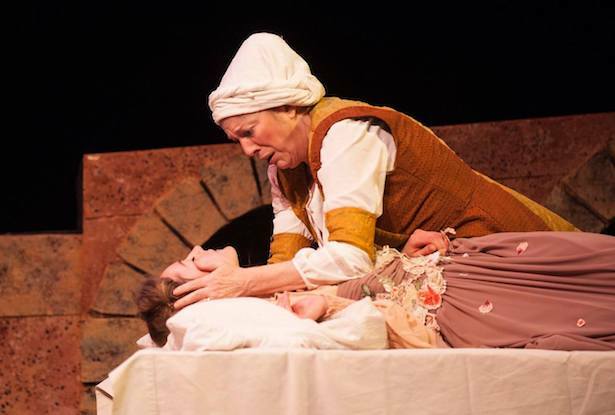 Claire Wittman, an actor from Staunton/Mary Baldwin’s Shakespeare scene, is filling in the role of Juliet for the opening weekend, with Liz Earnest completing the run the following weekends. The role of Romeo is completely new from the previous production, this time played by local Richmond talent Tyler Stevens. If you’re still not sold on the show, perhaps highlighting the more visual aspects of it will help you aboard the Romeo and Juliet boat. “If you’re a visual person, the costumes that we’ve got are pretty great,” said Earnest. Costumes help visualize the divide between the two families, but also include stunning detail, hidden pockets for swords and daggers, and quite visually stunning. “Alongside that, the fights that we’ve got in this play are really stellar. I wish I got to do one. They really kind of steal the show. They’re pretty incredible.” Almost immediately at the top of the show, a fight breaks out, starting the show off on an energetic note. 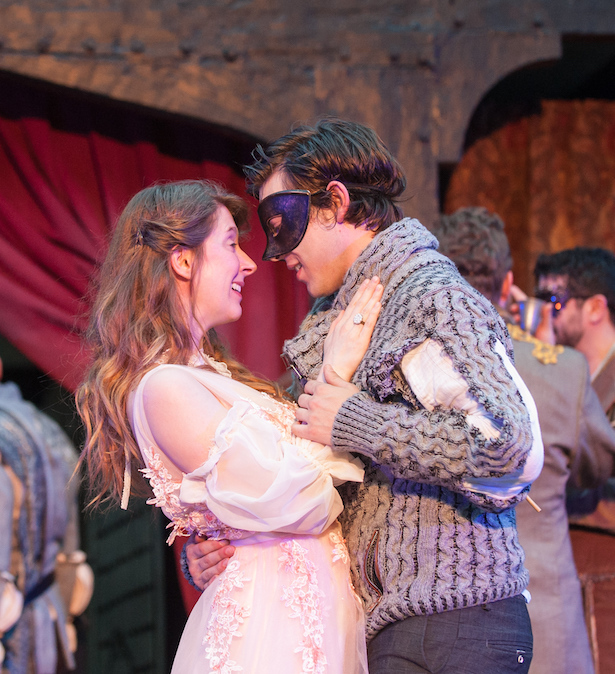 Romeo and Juliet opens at Agecroft Hall this Fri., June 1, and runs through June 24. Tickets can be found here at the Quill Theatre website. 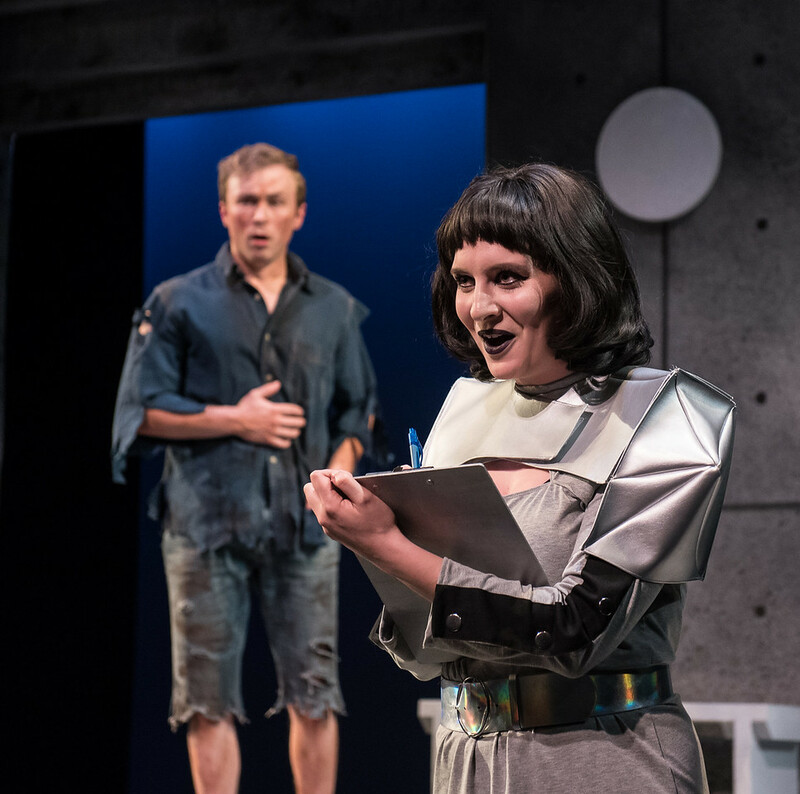 “It is a story of a false utopia…where humans are living in a controlled environment based on meeting their most instinctual desires, everyone is essentially conditioned and brainwashed,” said Maggie Roop, Director of Quill Theatre’s Brave New World production, which opened this past weekend. The parallels with our current society are everywhere. Similar to the book, the play tells of a society that has been neutered through baseline eugenics, pills, promiscuity, and overreliance on technology. In a twist on our current society, childbearing *outside* of a test tube is considered “savage” and base, and any anxiety is masked with a dose of “soma,” the society’s wonder-drug. Aldous Huxley, the author of Brave New World, was pained by a culture he saw as promiscuous and shallow. He paired these attributes with the ideals of carmaker Henry Ford to craft the society of “Brave New World.” The final product was a strong commentary on capitalist culture, mob rule, and anti-intellectualism. In this production, two members of “civilization” Bernard Marx and Lenina, take a trip to a “savage compound” that wouldn’t go along with society’s current paradigm. When Bernard and Lenina bring two savages back for “studying,” things go south precipitously. Michael Oppenheimer, who plays Marx, is a bit of an outsider in his society, questioning the ideology of the world he’s in and abstaining from “some trips” and group activities. Again, it’s hard not to notice the connection between this world and the “resistance” happening in our world. Actress Alex Wiles portrayed Lenina, a middle-class technician who’s known for her beauty and her myriad of lovers. Like Marx, she occasionally appears to question the rules she follows, but unlike Marx, fails to ultimately challenge her society. The meditations on speaking up and not blindly following along come alive beautifully with Wiles and Oppenheimer. Indeed, in a world where (virtually) everything can be done without leaving home, and “Alexa” is quickly becoming ubiquitous, audience members will find it hard not to see the mirror image in the production. For Roop, the parallels between “Brave New World” and today’s society are abundant, especially our obsession with social media and the rise of fake news and partisan media. “Right now, we’re in a world where we are feeding off information that … isn’t necessarily accurate, and we are people who self-medicate,” she said. Quill Theatre and the Cultural Arts Center at Glen Allen’s “Brave New World” plays now through Feb. 17 at 2880 Mountain Rd. Quill Theatre is no stranger to Shakespeare. But the everlasting words of Miranda spoken above inspired author Aldous Huxley to write his famous dystopian novel of the same name. Now, Quill Theatre is producing Brave New World for its 2017-2018 season at The Cultural Arts Center at Glen Allen. And yes, to the Shakespeare fans: there will still be quotes from the Bard peppered throughout. 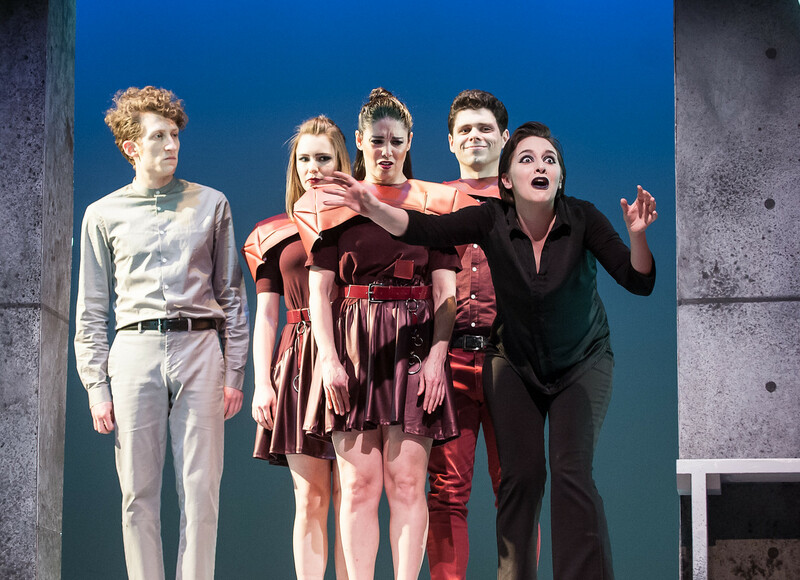 Directed by award-winning actor and director Maggie Roop, Brave New World speaks directly to the fears Huxley held in the mid-20th century about the rise- and potential horrors- of technology and control. Additionally, the implications of a monotone, restrained society without emotion and therefore human connection rings loudly throughout this production. Joseph Bromfield, (Henry Foster; High Priest; Arch-Community Songster), said Huxley was already troubled by the ramifications of the technological process he was seeing. “I can hardly imagine what he might say if he saw our modern world of demands-filled-instantaneously-with-the-click-of-a-button, smartphones, unlimited digital space, massive information archives, and phrases like “fake news” entering the political arena,” he said. It is rather opportune how Quill wishes to discuss the possibility of what our future could look like during a time when our technology and regimes are mimicking decades-old dystopian novels. “It’s just kind of relevant how all of our technological advances and things like that have often meant us disconnecting from one another,” said Rachel Hindman (various roles). Hindman goes on to discuss how the world within Brave New World warns against the dangers of the absence of human connection, a manipulative tactic utilized by the powers-that-be, mixed with the overwhelming rise of technology. “They’re afraid to feel emotion. Well, they’re not afraid, because they don’t know what being afraid is. They don’t want to feel emotion, they don’t want to feel happiness, because with happiness comes sadness and other different emotions that are scary and unknown to these kinds of people.” Hindman’s reference to the little pills of soma given by the government to the different castes seem farfetched now, but have frightening possibilities given pharmaceutical and technological advancements. Although these themes sound rather daunting and dark (which, to be fair, they are), the meaning is sound. The speed at which we connect, compute, and control is increasing year by year. “Storytellers like Huxley, Orwell, Atwood and many others imagine and propose dystopian or false utopian futures as perhaps a warning, a cautionary tale, or a call to action. In times of political and cultural turmoil we are drawn to revisit these stories and compare them to our current circumstances and climate,” said Roop. The talent doesn’t stop here. Catch the rest of the colorful, adroit actors in Brave New World starting Feb. 2 at the Cultural Arts Center at Glen Allen. The play will run through Feb. 17. Tickets are $28 and can be found here. 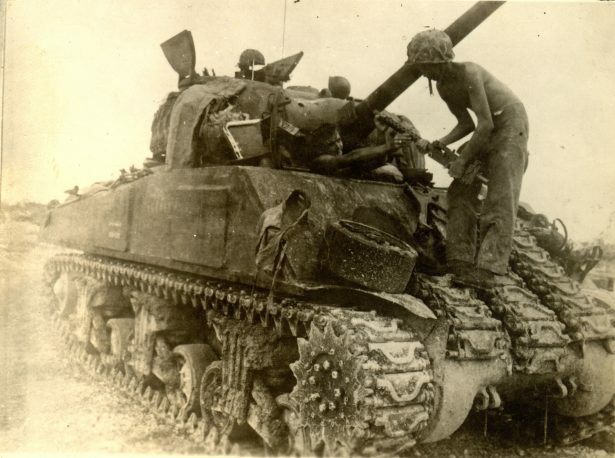 The one-night-only event features real letters from WWII soldiers and their loved ones back home, collected by James Triesler, a historian and the director of education at the Virginia War Memorial. Quill Theatre has been doing historical readings for some time, but it has only gained momentum in the past four years. Starting in 2014, they began a historical reading series carrying a different theme every year with a focus on Richmond. Although not all the letters in the performance are from WWII Richmond veterans, the majority of them are from Virginia. Some of the letters were written by veterans who still live in Richmond today, such as Joe Keller, a resident of Henrico County. Several are from different places around the United States, and a couple are from British soldiers as well. 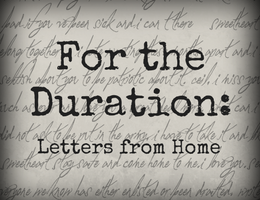 Over 70 letters or excerpts from letters will be featured during the performance. A cast of four actors will be reading the letters, while James Triesler acts as narrator to provide context and information about each of the individuals in the collection. The performance will include an audio-visual component as well, so audiences may see photos of the original letters. Webb and Triesler, who also co-wrote the narration, have been putting the project together for the past year. All the letters were acquired by Triesler from interviewing veterans or from the “It Took a War” project at Clover Hill High School, and many of the original letters are currently on display at the Virginia War Memorial. The one-time performance is Tues., October 17, 7 p.m. at the Virginia War Memorial, 621 S. Belvidere St. Tickets are $12 for members, $15 for non-members.